1. Ride a bike in the winter? Is this some kind of joke? While we do appreciate pranksters, hyperbole and cleverly named events, the mission of Bike Winter is earnest: to help people discover that every day is a great day for riding a bike. Our tips, facts and events will keep you rolling long after the first snowflake falls. 2.	Who is in charge of Bike Winter? Bike Winter is an all-volunteer, grassroots effort. Every year, one or two people step up (or get drafted when they step away to buy beer) to lead outreach efforts and coordinate event planning. Many thanks to our current and previous Bike Winter Chairs and other dedicated volunteers. 3. How can I get involved? Great question! The simplest way to advance the cause is to ride your bike year round and patiently field the questions of your surprised family, friends and co-workers. But if you want step up your Bike Winter missionary work, or just meet other layered cyclists, there are many ways to help out, such as making balaclavas to give away at classes and helping promote and organize events. Also, it helps to always carry spare stickers and an extra gaitor to give to curious strangers and faltering cyclists. 4. How is Bike Winter related to other sustainable transportation efforts? 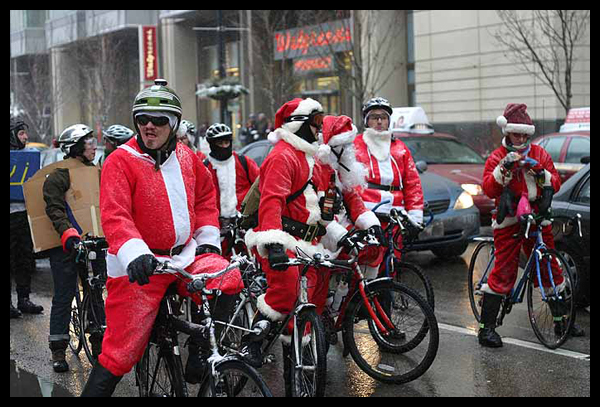 Many of the people involved in the early days of Bike Winter met through Chicago’s Critical Mass rides. Over the years, these rides have fostered a community of bicycle activists who have launched projects such as Break the Gridlock, a non-profit “umbrella” organization devoted to promoting appropriate transportation and reducing automobile dependence in the Chicago area. Break the Gridlock provides logistical support--including 501 c 3 status--for grassroots projects like Bike Winter. Thanks BTG! 5. Does Santa ride a bike? With concerns about climate change and his waistline, Santa has been seen two-wheeling around town throughout the year as he spot-checks his naughty/nice list. Word around the pole is that he has a special fondness for winter bikers, in case you needed one last reason to pump up your tires in December!